Parasitic Wasps For Control of Moth Populations! 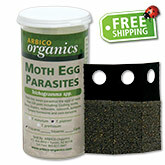 ARBICO Organics™ carries fours species of Trichogramma wasps for control of moth eggs that develop into damaging caterpillars. Each species has a particular specialty, so pay attention to which species suits your needs best. Similarly to other Biological Controls, environmental conditions must be suitable for best results to be achieved when using Trichogramma. Weekly and biweekly shipment programs are available for T. minutum and T. platneri. A minimum of three shipments is required for program orders. Simply set the quantity to the number of shipments you would like to receive and proceed to checkout. Please call us with any questions or concerns regarding any of the Trichogramma species and their uses. 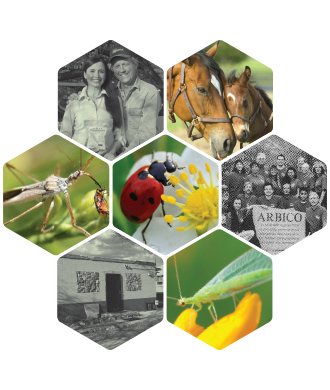 Various species of Trichogramma are used as biological control measures for different moth issues in agricultural, urban and home settings all over the world. For instance, moth egg parasites are readily used indoors in the United Kingdom for controlling common clothes moths. If you are laying out an Integrated Pest Management program to control a moth pest, Trichogramma will likely be an imperative step in that program as they help break up the moth's life cycle by reducing the number of hatching larvae (Caterpillars/Borers) that can mature into egg laying adults. Combine Trichogramma with Trapping measures to improve control of multiple life stages of moth pests.